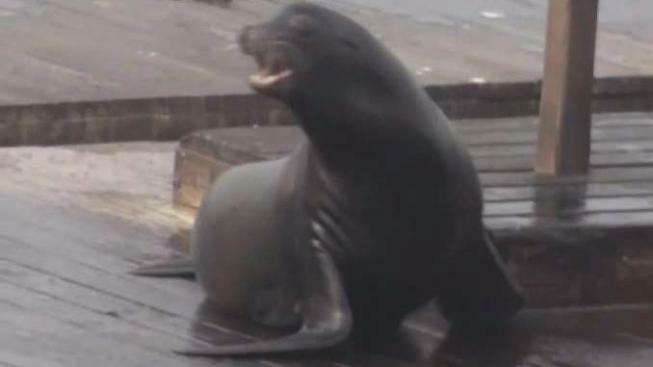 The sea lion population in San Francisco Bay has more than tripled over the past three decades, according to wildlife officials. And while the spike may be good for the ecosystem, it's also creating competition for local fishermen. Sea lions in many ways have become synonymous with the City by the Bay. But just as people who live San Francisco are being priced out of the city's expensive housing market, there is growing competition between commercial fishermen and sea lions for resources out in the bay. At Pier 39, the sights and sounds of sea lions draws millions. "For us, it’s just maintained this always fantastic attraction because it’s always enough, as you can see here, for people to come," Harbor Master Sheila Chandor said. That hasn’t always been the case. The Marine Mammal Protection Act, landmark legislation signed in the early 1970s, saved the species from extinction after decades of being hunted. A new report released Wednesday by the National Oceanic and Atmospheric Administration shows the sea lion population has soared from 89,000 in 1975 to a peak of 306,000 in 2012. "They are very good evidence that the bay is pretty healthy and that there is a lot of available food out there," Chandor said. But the increase in sea lions also means increased competition with commercial fisherman. "You end up with too many sea lions, and they end up eating the bottom of the food chain species," fisherman John Barnett said. Barnett has been fishing out the bay for the past 13 years. He isn’t against the Endangered Species Act, but he said the rise in the sea lion population has impacted the local fishing industry. And it's not just about profits; it’s about he ecosystem as a whole. "You are saving them and putting them back out there, and it’s affecting the food source for the healthy ones," he said. "So you are actually making it a weaker species." Environmentalists say it’s important to keep the Marine Mammal Protection Act because one natural disaster or oil spill could wipe out an entire species.